Professor Gong Ke was born in 1955 in Beijing, China. Having obtained his Bachelor degree from Beijing Institute of Technology in 1982, he studied further in the Technical University Graz (Austria), where he worked on wave propagation in satellite links and obtained Doctor Degree of Technological Science in 1986. In July 2006, he was appointed as President of Tianjin University. 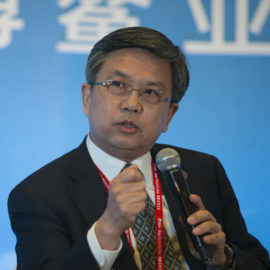 Prior to that, he had been working in Tsinghua University, Beijing, as a full professor (1994), Chairman of the Department of Electronic Engineering (1997), Director of State Key Laboratory on Microwave and Digital Communications (1998), Vice President of Tsinghua University (1999) as well as Dean of the School of Information (2004), and Director of Tsinghua National Laboratory for Information Science and Technology (2005). Professor Gong Ke now also serves as Vice President of the Chinese Institute of Electronics, Vice President of China Institute of Communications. In 2006, he was elected as a member of standing committee of the China Association for Science and Technology. In November 2009, he was appointed as Chairman of the Committee on Information and Communication (CIC), which is a Standing committee of WFEO. In January 2014, he has been appointed by Ban Ki-moon to the Scientific Advisory Board of the Secretary-General of the United Nations. Since December 2015, the Chinese Association of Science and Technology (CAST) serves as the host of the Committee on Engineering for Innovative Technologies from 2016 to 2019. Professor Gong Ke is the Chairman of this Committee. WFEO elected Prof. Gong Ke to the position of President-Elect at the Federation’s General Assembly in Rome, 1st of December 2017.